Our society idolizes youth. Young people know what to say, what to wear, and where to go. Young people move quickly and adapt easily. Young people embrace hope and technology and causes. Young people are cool. But as one of our seniors turned 90 this weekend, I was reminded of the many lessons that can only be learned from godly elderly people. 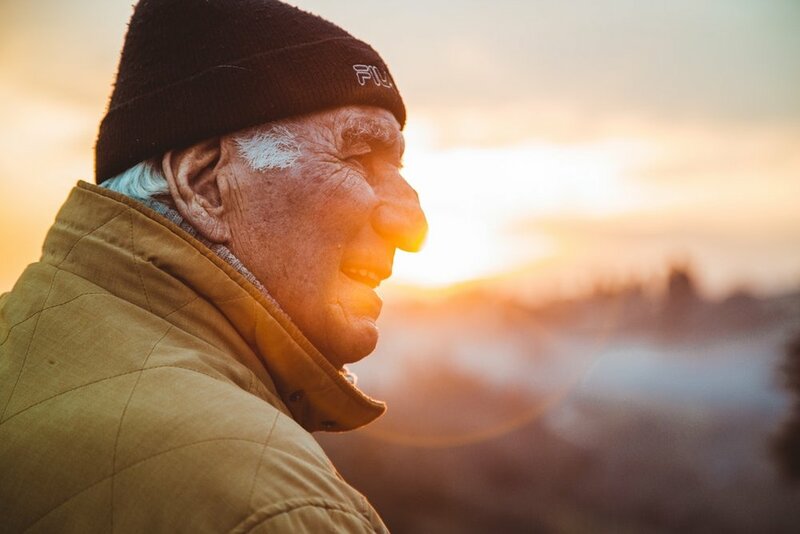 Proverbs 20:29 says, “The glory of young men is their strength, but the splendor of old men is their gray hair.” I fear we’re losing the wisdom of this truth as a society, but the verse is saying that while youth have strength and energy on their side, grey hair has an inherent dignity to it. While aging may bring aches and pains, there is a wisdom and maturity borne in experience that can only be attained over the long haul. As Job said, “Wisdom is with the aged, and understanding in length of days” (Job 12:12). Let me share some of the things that our seniors have taught me. Godly seniors teach us hope in suffering. When we’re young, we try to avoid suffering. We like to live in denial that it’ll ever happen to us. And when it comes, we’re often undone by it. Seniors don’t have the luxury of living like suffering is for other people. They have to confront it, often on a daily basis. And seeing how they patiently endure inspires my own courage in hardship. I often speak with a woman who faces terrible physical hardship. But whenever I ask how she is, she always responds, “Well, I have nothing to complain about, because the Lord has been so good to me.” I’m convinced that she could be riddled with gunshot wounds and she’d respond the same way. The fact is that she really has laid hold of the goodness of God in the midst of her trials and found His sufficiency. That gives me hope. Godly seniors teach us love for the Word of God. When people are young, there are so many things to do. The body has to be sculpted into the perfect form. The career has to be shaped for maximum achievement. The relationships need to be cultivated and the opportunities for activity and entertainment are endless. It’s hard to fit it all in. And often slow, meditative time in the Bible suffers. When the Bible is read, it’s often for understanding or answers to pressing questions. Godly seniors don’t read the Bible like that. They love to hear God’s voice. They savour the Bible more than just reading it. They delight in God’s Word more than just trying to figure it out. It’s personal for them. And their love for the Word of God stirs my own. Godly seniors teach us about prayer. There’s a kind of invincibility that comes with being young. Young people think they’re strong enough, smart enough and passionate enough to do almost anything. And there’s something wonderful about that energetic hopefulness. But godly seniors have learned something else. They’ve learned that many of the most important things in life are humanly impossible. They’ve come to realize that human strength and ingenuity inevitably hits a wall that can only be overcome by the power of God. And they lay hold of that power in prayer. When we’re young, we’re often too impatient to pray. Godly seniors have learned to trust God and know that in seeking His strength they can change people and circumstances that no amount of human energy could budge. But they don’t just pray because they want things either. They pray because they genuinely enjoy God’s presence. They talk with God and experience His nearness. Being around them inspires my own prayer and changes the way I pray. I’m grateful for the rich heritage of godly seniors that God has given our church. I love when I see younger people seeking their counsel. I love when I see the interest they take in other generations in our church. And I love our Life After Fifty-five Ministry because it’s there that I see younger retirees serving and learning from older retirees. For me, I feel like I get a bi-weekly workshop in senior wisdom and gracious aging. I only wish more people could get in on it! Leviticus 19:32 says, “You shall stand up before the gray head and honor the face of an old man, and you shall fear your God: I am the LORD.” God knew what He was doing when He urged this kind of respect. We’re all better for it. May God help us to nurture it!